I did these hills in bad weather and my photographs consisted of clag taken through a wet lens. I therefore did a google image search to find this picture taken from the summit of Meallan a'Chuail and looking towards the lower hill, Meall an Fheur Loch (centre). 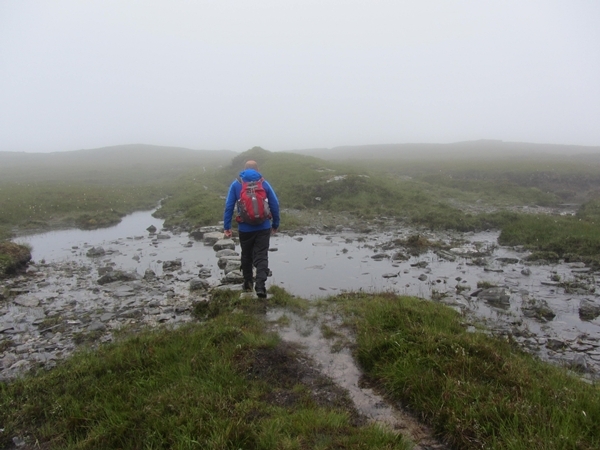 ​Beinn Leoid could be included in this walk, but as the weather was so poor and I had previously climbed the Corbett, I just did the two Grahams. When travelling south along the A838, approximately 2km beyond the end of Loch More, a footbridge will be seen on the right. This indicates the start of the recently improved stalker's path up the side of the Alltanan an Doire Dhuibh. There is sufficient space for two cars at the end of the next passing place. This is just off the road and parking does not obstruct drivers using the passing place. For many years, I have walked alone. There are many closet hill-baggers out there but I have always been a rampant bagger; someone who never needed to come out of the closet about such matters as I never hid in the closet in the first place. I cannot understand people not climbing their last Munro in the fear of an anti-climax and a feeling of being deflated, like for those whom the thrill of 'romance' is in the chase rather than the 'conquest'. The refusal to 'compleat' often comes with self-righteousness and denying that they are baggers, even though they have clearly been keeping a tally. I wonder if such people deliberately miss a page in a book so that they can say that they have not read it. I really cannot understand the reasons for not completing the task. I hope that such 'non-compleatists' do not apply the same philosophy to their professional lives! Successful bagging requires a certain single-mindedness and a selfishness that means that I climb the hills I want (or need) to do, rather than tagging along with the plans of others. Walking alone gives a greater sense of freedom and increases the challenge of climbing hills. One is less distracted by others and therefore more tuned in to one's surroundings rather than the banter. One never feels guilty of holding others up and there is never the frustration of waiting for others. There is no giving in to the apathy of others and spending the day in the nearest pie shop. 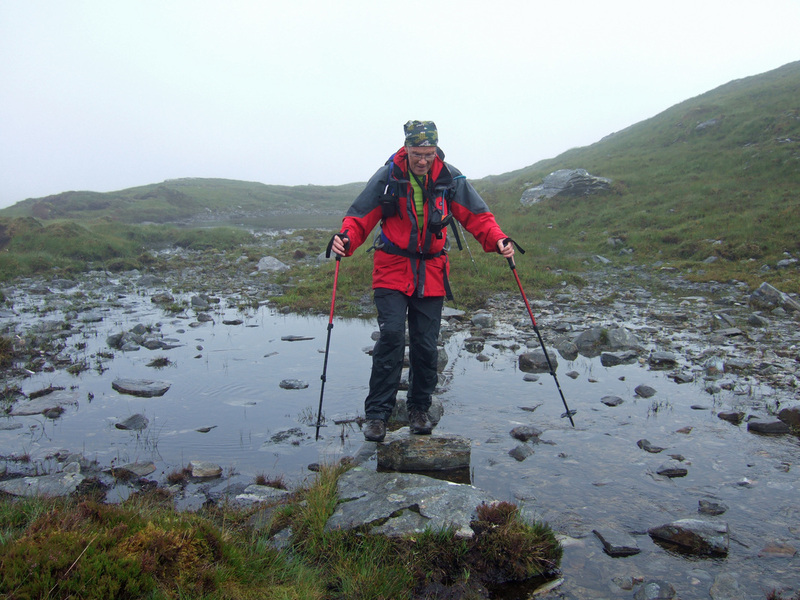 However, much of my early walking had been done with walking and mountaineering clubs and I miss the camaraderie. Therefore, I was very much looking forward to the Walkhighlands meet at Inchnadamph. Due to the adverse weather, there was a certain amount of indecision about people's plans on the Saturday morning. Some were talking about an ascent of Conival and Ben More Assynt, which made perfect sense as we were based at the foot of Conival. However, I have climbed these hills twice, with my last ascent being relatively recent; in 2011. Others were heading for a coastal walk to the Old Man of stoer; a beautiful walk but I had a strong craving to head for higher ground, regardless of the weather. 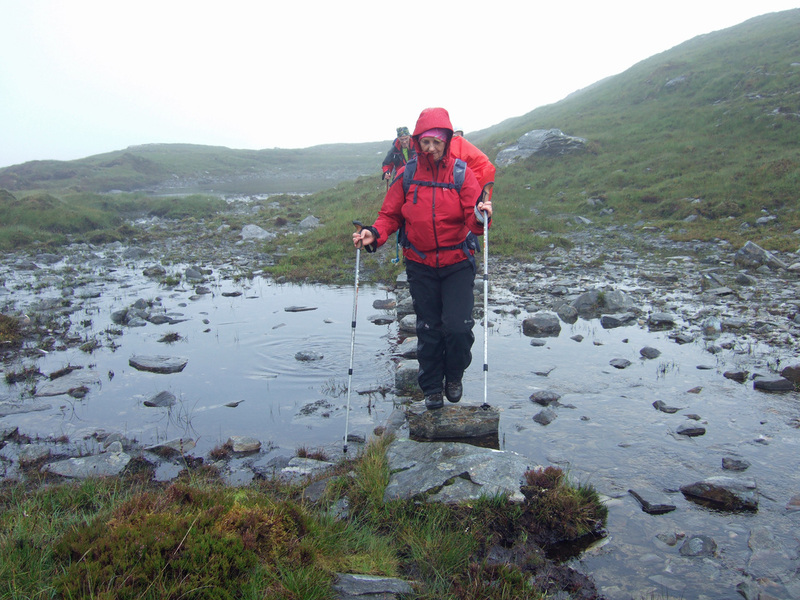 There was a further group talking of Beinn Leoid, a hill I bagged in similar weather as part of a three day expedition back in 2000, taking in the bothies of Glencoul and Glendhu. However, I saw an opportunity of being a little bit sociable for part of the day before heading off for a couple of unclimbed Grahams on my own. 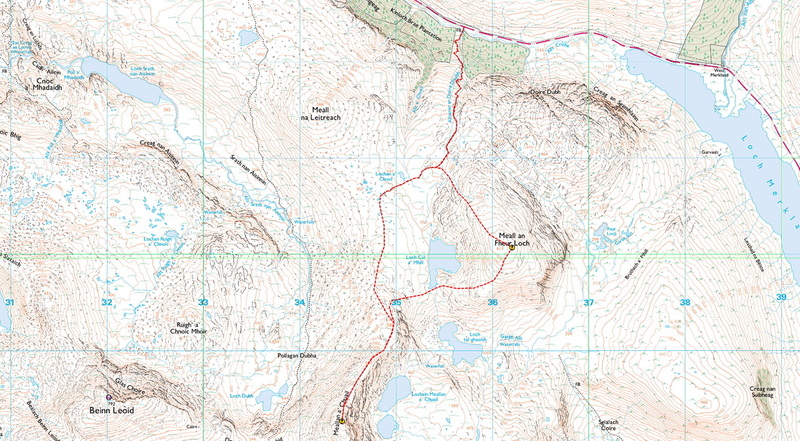 The route taken enabled me to bag a couple of peaks, while giving a shorter day in such inclement weather. ​Photograph below courtesy of "The Rodmiester". There has been some felling in the forest at the start and we were unsure as to whether this would impede our progress. However, there is a sturdy footbridge leading to an excellent stalker's path up the hill. This has seen recent maintenance with stone chippings being laid down and drainage channels added so that it does not become a man-made watercourse during a downpour. The work is still in progress and white bags of stones were found at regular intervals up the lower parts of the path. I assume that these were lifted in by helicopter. ​Higher up, there were stepping stones across a burn. After marking 200 examination scripts for the International Baccalaureate during May and June, I decided to spend just a small part of my extra earnings on myself and bought a Suunto Crush ABC (Altimeter, Barometer, Compass) watch. I did not go for a full GPS watch as I did not want something that I would need to recharge via USB. However, an altimeter is a very useful navigational tool, if it is accurate and reliable. Being a barometric altimeter, it is not reliant on being in line of sufficient satellites. The barometer has a storm warning function and the compass acts as a second back-up to my main conventional compass and the spare in my first aid kit. I pride myself on my navigational skills, but while I can take the right bearing off a hill and read the lie of the land, it can be difficult to determine precisely one's progress up or down a mountain. Knowing one's altitude enables one to more precisely determine one's location. 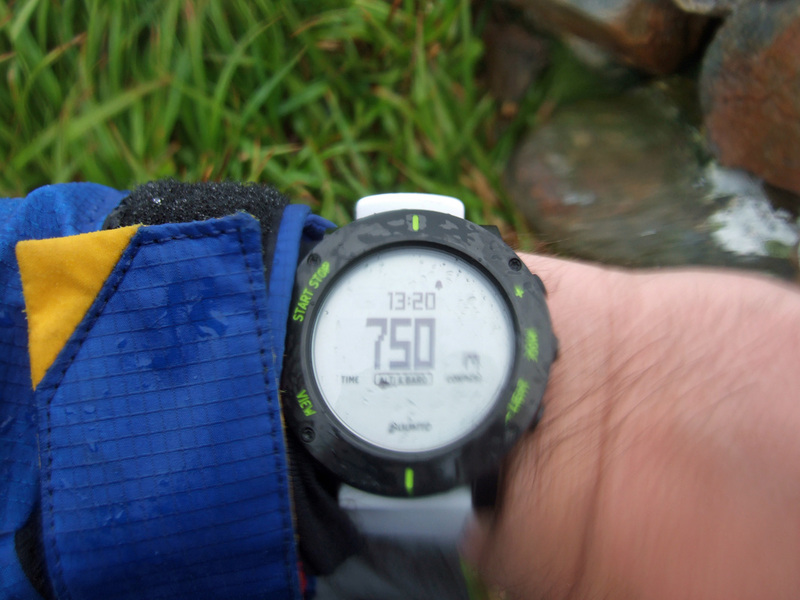 Such horrid, dreich conditions were ideal conditions for some field testing of the watch. However, it needs to be set at a known reference point and I forgot to do this at the start. Soon after leaving the others, I reached a large flat area within a 500 metre contour line on the map, so used this as a reference point to within 10 metres. 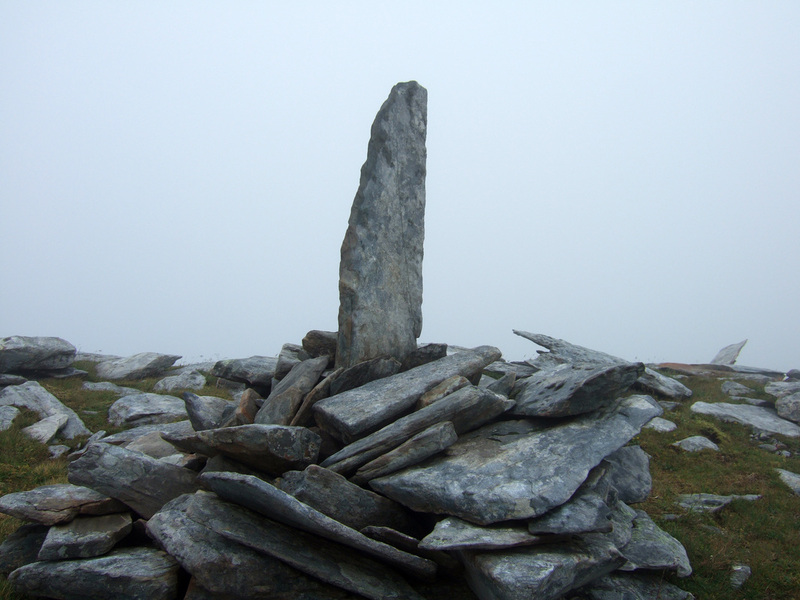 On reaching the summit of Meallan a'Chuail, I checked the watch to see the altimeter reading . . . . The spot-height on the map was . . . . 750m! Impressive! 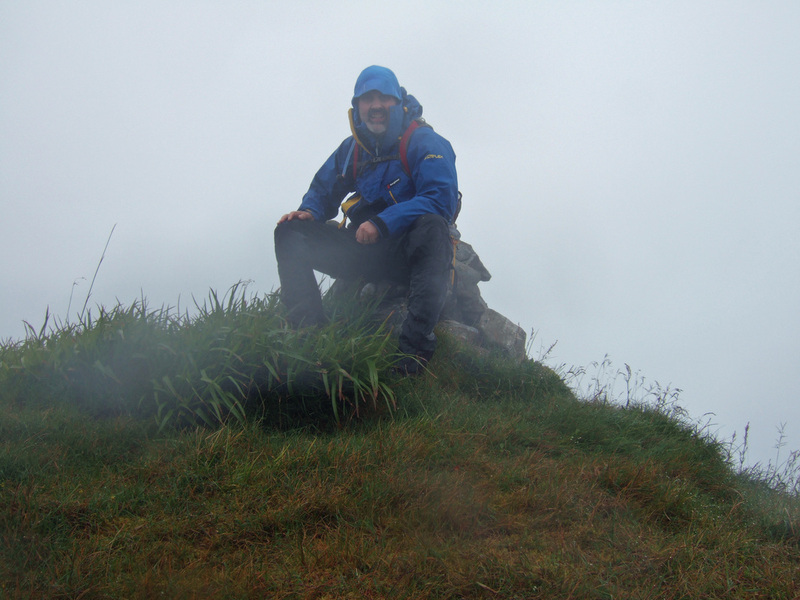 It was very wet and windy on the summit and by the time my camera was placed on the Gorillapod and the ten second delay set (Why don't camera manufacturers include the possibility of a thirty second delay to allow one traverse wet boulders to get into position? ), the lens was wet, resulting in very blurred summit selfies. I did not linger on the summit, but retraced my step but at around 550m bore east rather than heading north for the end of the stalker's path. 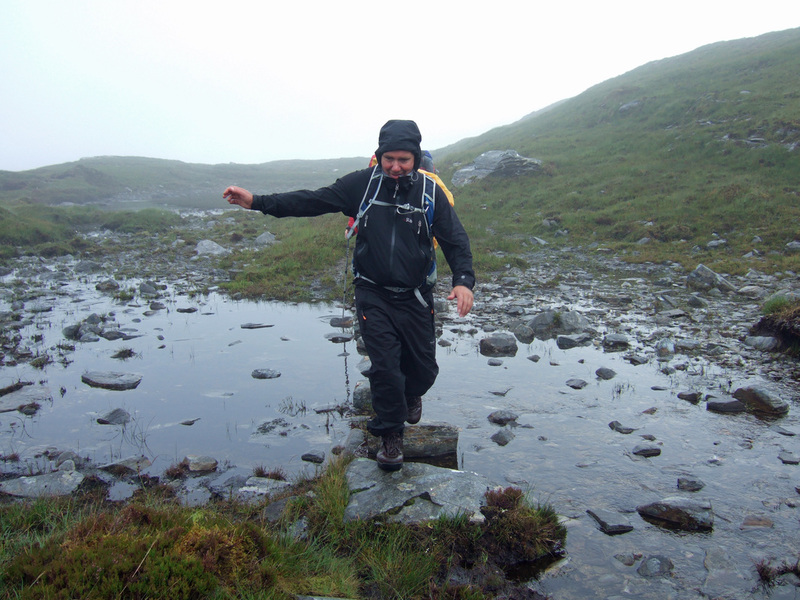 I was aiming for the bealach at the outlet of Loch Cul a'Mhill (450m), a good point to check the altimeter reading. Recalibrating the altimeter at each possible reference point results in more reliable readings. ​The broad ridge rises up at an easy gradient and is easy going underfoot. The drop from Meall an Fheur Loch to the bealach is circa 167 metres, which is not much more than the minimum 150m to give it Graham status. 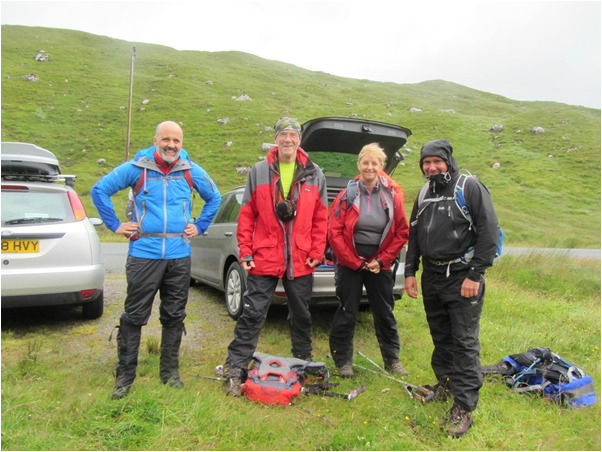 All this means that the cairn of Meall an Fheur Loch was soon reached with minimum effort. 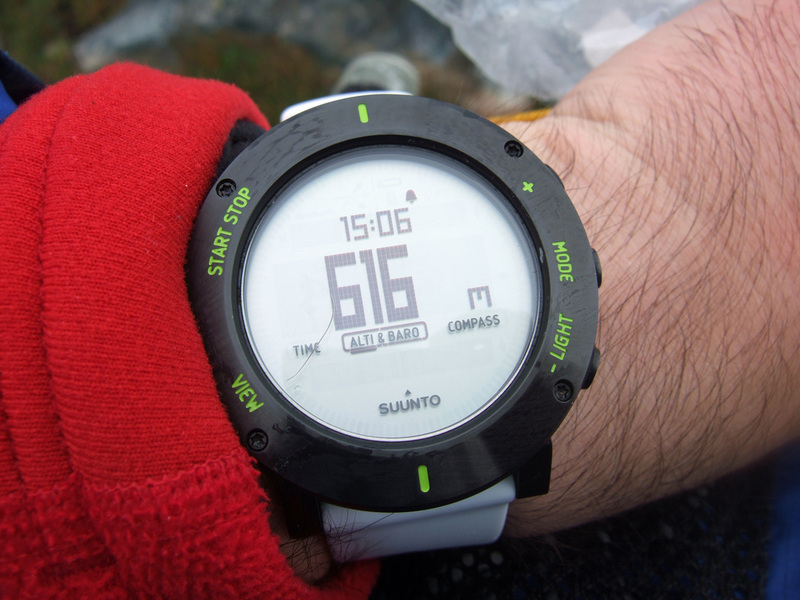 The reading on my watch was 616m with the height given on the map being 613m, a more than acceptable difference. I am impressed and if the watch lasts, the cost will be justified. I wonder how the accuracy of a barometric altimeter. For a discussion on this, click here. ​I headed northwest, reaching the stalkers path just above the stepping stones and was back at the car within the hour.